How to make meatballs that are tender and juicy boils down to two things: good technique and good ingredients. My father's meatballs were famous amongst our family and friends when I was younger. 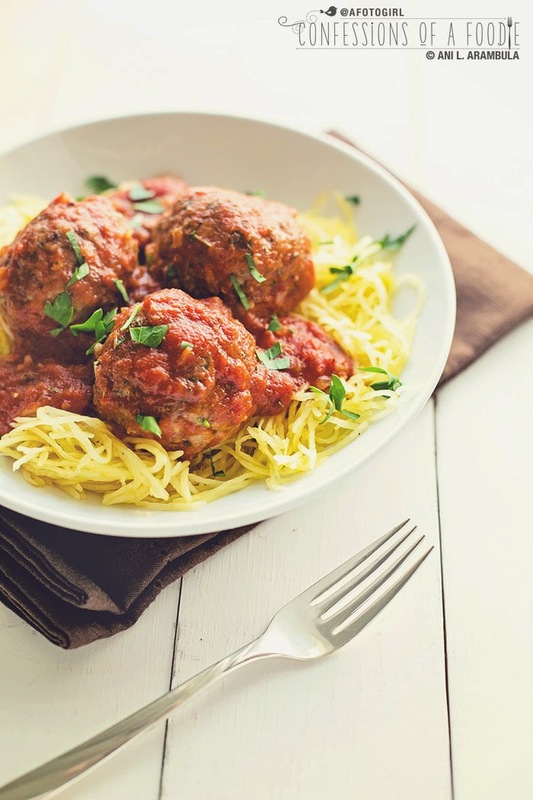 Whether they were being served in sandwiches, accompanied by spaghetti, or served with his even more famous lasagna, the meatballs inevitably stole the show. You'd think that making meatballs would be easy. With such simple components, how hard can it really be? Meatballs are just ground meat, seasoning, a little egg, a little milk. Doesn't sound too difficult, right? My experience has proven that the perfect meatball is rather elusive. I've found that ordering meatballs at restaurants is like opening a White Elephant gift: either it's a joke impersonating a meatball or it's almost a winner. From overcooked and or tough, to mushy and spongy (worse, am I not right? ), they often lack flavor. It would seem that Dad's tender, flavorful meatballs have spoiled me. 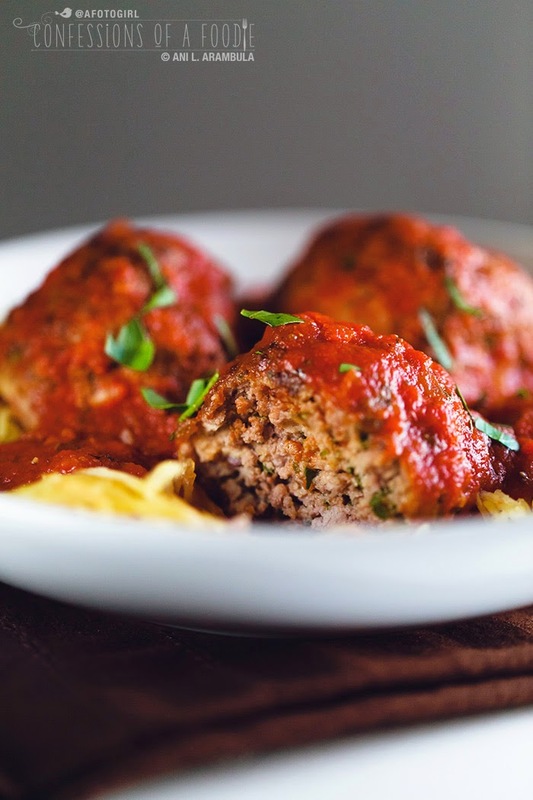 So I decided it was time to share a few family secrets to making a good meatball. Is this the quintessential Italian meatball? Hardly. I'm not Italian after all. But it is a tasty meatball and one I've grown up loving. I've tweaked my Dad's recipe ever so slightly, putting my own stamp on it as most cooks are wont to do. Regardless of whether you're making traditional meatballs or experimenting with the flavor profiles (Greek, Mexican, Moroccan, etc. ), it all boils down to good technique and good ingredients. 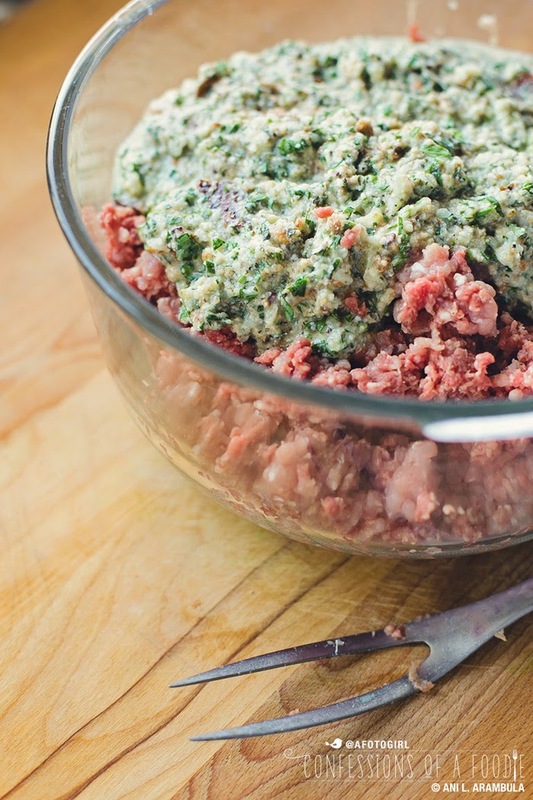 Number one on my list is the most crucial and it holds true whether you're making meatballs, meatloaf or hamburger patties: Don't overwork the meat. Overworking the meat compacts it, making it dense and tough. Overcoming this is easy: I use a carving fork to mix my meat, using quick short "rakes" through the meat, and using it fold the meat so that you're lifting the meat up and over. I frequently tap the fork against the bowl to release meat stuck on the tines. If left to continue accumulating on the tines, the meat will get compressed and that's a no-no. Second, use two meats: Although the classic meatball is made with ground beef, my personal preference is to add some ground pork. In addition to adding juiciness, I find the pork adds more flavor. This especially holds true if you're planning on using turkey or chicken in place of beef as these meats can be quite lean and meatballs made from them can dry out before proper internal temps are achieved. Next tip? 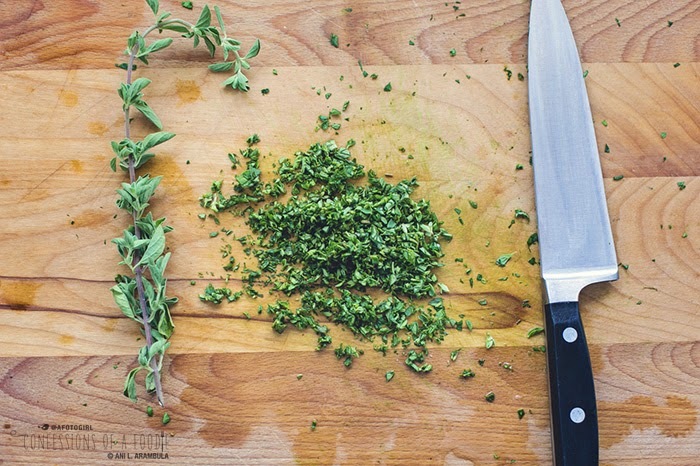 Use fresh herbs whenever possible – lots of them. I use fresh parsley, oregano (Dad doesn't), and marjoram. Also equally important, add onion and fresh garlic. The trick here though, is to grate the onion instead of chopping and to press the garlic. This is something my Dad doesn't do, however, I found that grating the onions and pressing the garlic means you aren't biting into chunks of onions and garlic yet each bite is delicately flavored with these two vegetables. 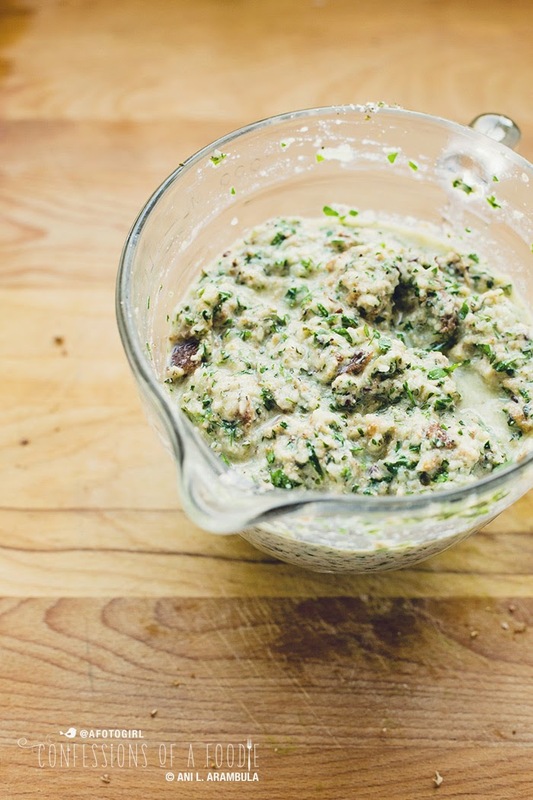 I learned this trick not in my meatball making endeavors but from Caron Golden, a local food writer and recipe developer, while making her recipe for zucchini pancakes for a food cover several months back. I thought it was genius and have incorporated the technique into many dishes since. 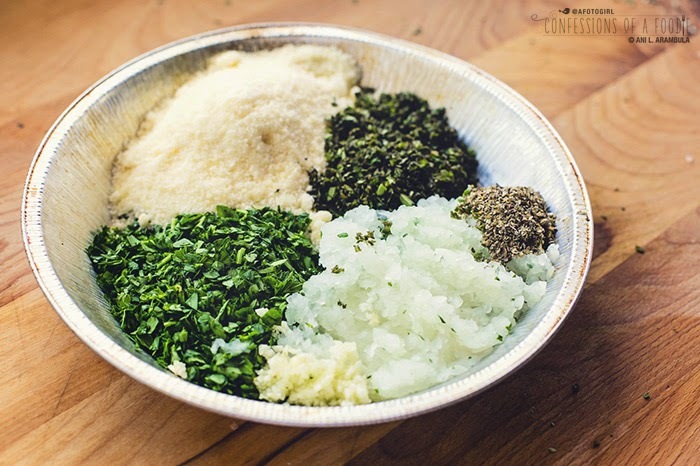 And lastly, this next suggestion is a cue taken from baking: Mix all the wet ingredients and seasonings together prior to adding it to the meat to cut down on the amount of handling the meat needs to endure. As for browning the meatballs prior to baking them, I'm going to leave that up to you. Sometimes I do, sometimes I don't. If I'm not making a huge tray of meatballs and I'm not in a hurry, sure, I'll brown them first. But I'm usually making a large batch and honestly, I often don't feel like taking the time to also brown. However, if you're forsaking the baking and want the meatballs to finish cooking in a large stockpot of marinara sauce, then do first brown the meatballs before adding them to your sauce. 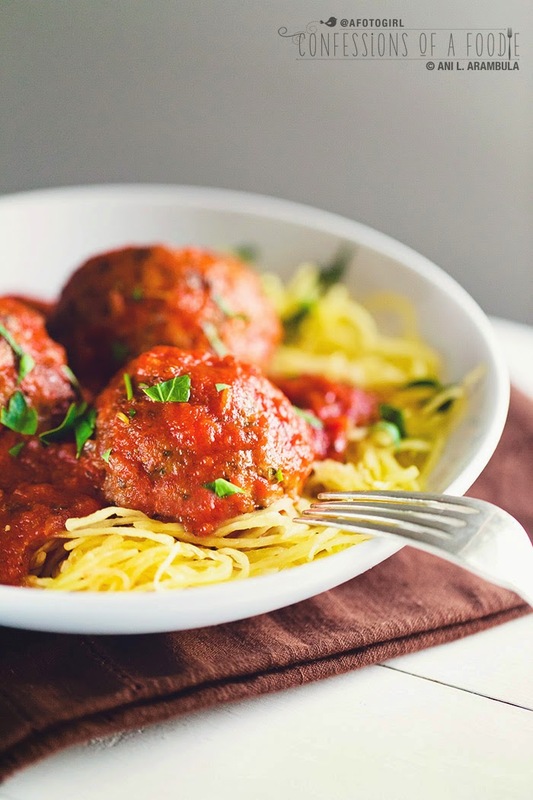 When I decided to share this with you all, I was craving spaghetti and meatballs. Since I've adopted a low carb, no white flour diet, I was determined to enjoy my craving without crashing my diet. 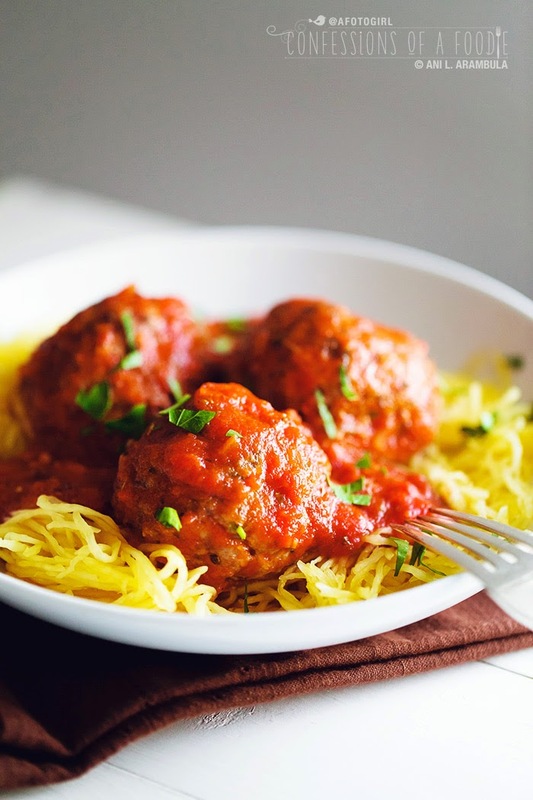 I have spaghetti squash stepping in for pasta and really, I have come to like this "spaghetti" so much better than wheat spaghetti because I can enjoy my meal without feeling tired and bloated 10 minutes later. Give it a try this way and let me know what you think. Okay, primer done. Ready to make meatballs? This recipe makes about 20 meatballs using a size 16 food service scoop (bowl holds 2.75 ounces, bought locally at Smart & Final, green handle). The squash and the sauce serve 6 with 2 meatballs each. 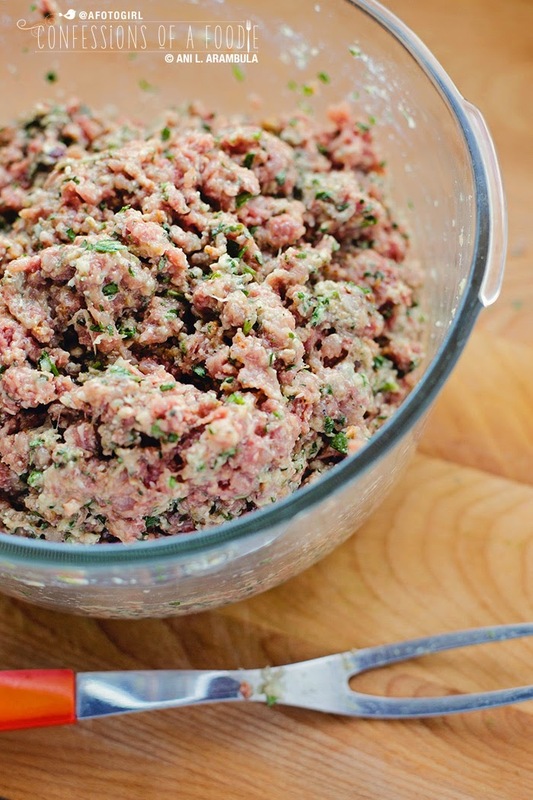 Freeze the rest of the meatballs for later use. I love to pull them out of the freezer, pop them into a steamer basket (or, really in hurry, the microwave) for quick last minute meals. Double the sauce and squash and you can easily serve 10. Also, a note on the onion for the meatballs, I find that cold onions release less of the tear-inducing enzyme when cutting them. Place the onion in the freezer for 10-15 minutes before you need it. For baking both the squash and the meatballs, I used a pair of rimmed ¼ sheet pans (aka, jelly roll pans). If you want your meatballs a little more crispy on the exterior, use a larger rimmed baking sheet and space meatballs 1 to 1 ½ inches apart. I like to pack mine somewhat tightly so they stay juicier. 2. 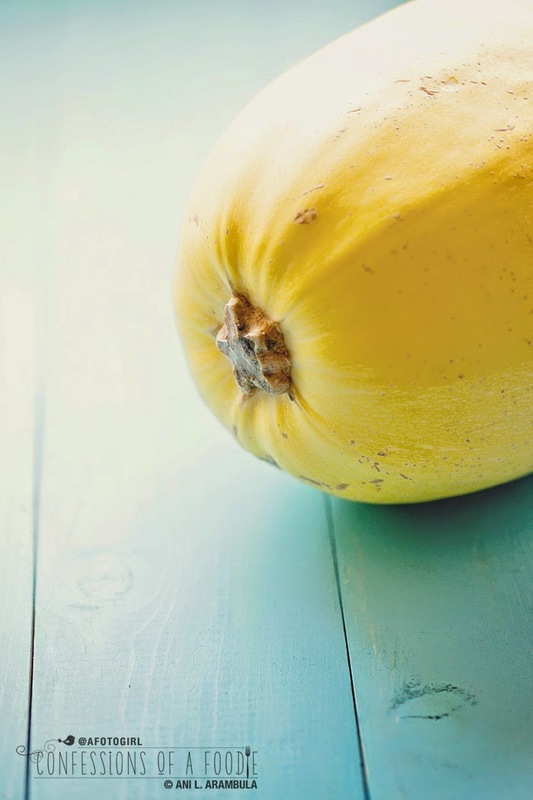 Split the squash in half length-wise. 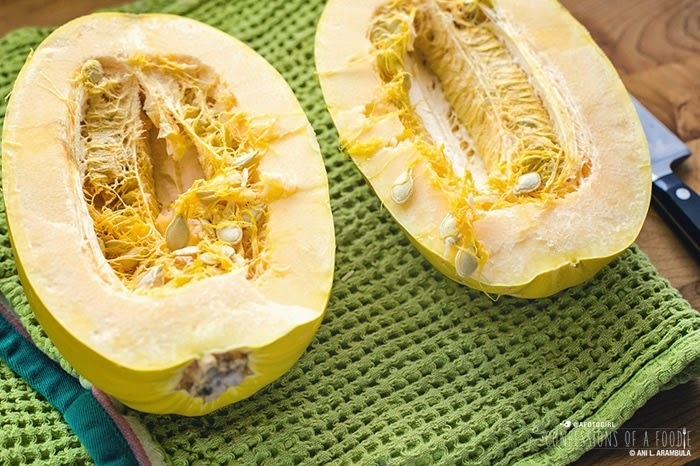 Remove and discard seeds. Place cut-side down onto a rimmed baking sheet. 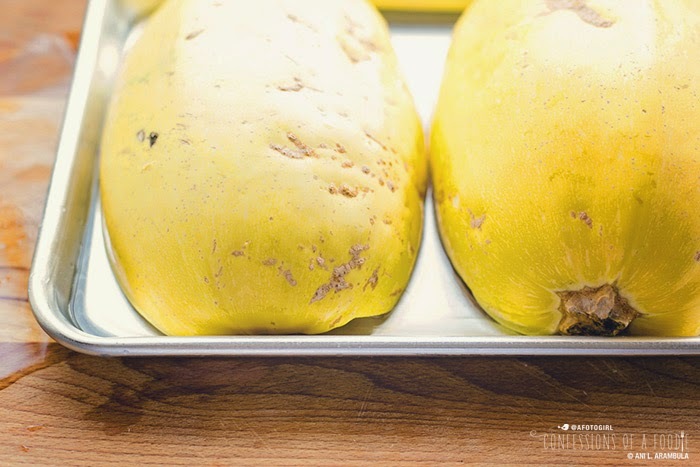 Add ¼ cup water and roast for 25-30 minutes or until "al-dente" (the squash flesh should easily pull apart into spaghetti-like strands when raked with a fork while still maintaining a bit of a crunch; don't over bake as it will get mushy). When ready, remove from oven, cover with foil and set aside. Lower oven temperature to 400 degrees. 3. 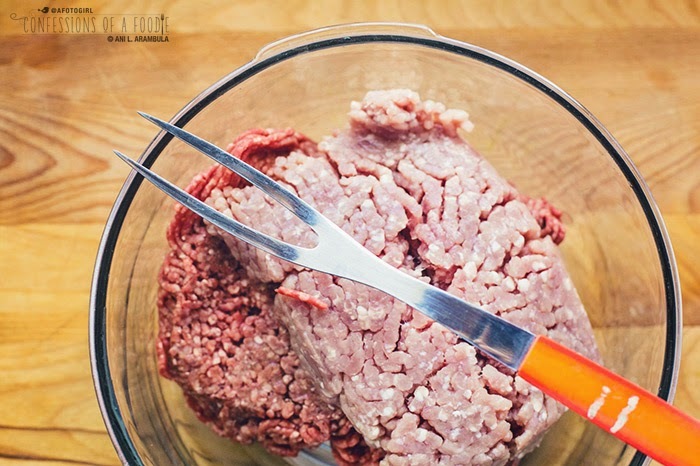 Make the meatballs: Place the two meats into a large bowl and use a carving fork or gently use your fingers to break apart and combine meats. Careful not to compact or overwork; set aside. 4. Pour milk over cubed bread in a large bowl. Stir well to combine and let stand 10 minutes to allow bread to absorb milk. 5. 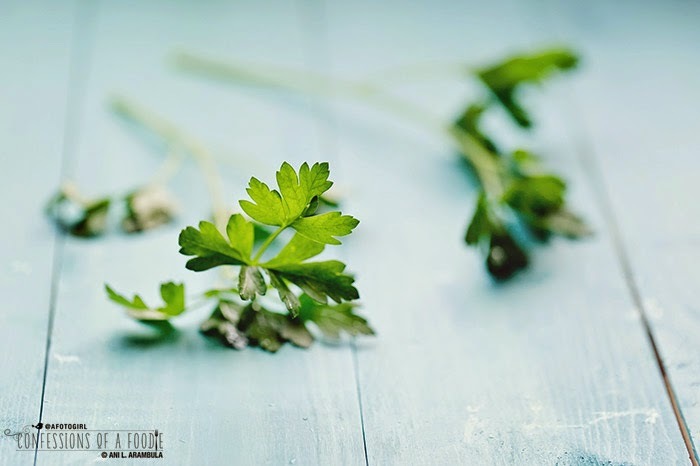 In the meantime, chop the fresh parsley, oregano and marjoram. Using a food processor or the large holes on a box grater, grate the onion. Crack the egg into a small cup and lightly beat, breaking up yolk. 6. Back to the bread mixture, give it a good stir then use your hands to crush any chunks and bits of crusts. Continue crushing with hands until the texture resembles oatmeal. Drop in the chopped herbs, grated onion, pressed garlic, egg and parmesan. Add the salt and pepper then stir well to combine. Pour into the meat mixture. Alternate raking and folding the meat with the carving fork to combine all of the ingredients. 7. Spray a rimmed baking sheet with olive oil cooking spray. Use a scoop to portion out the meatball onto wet hands. 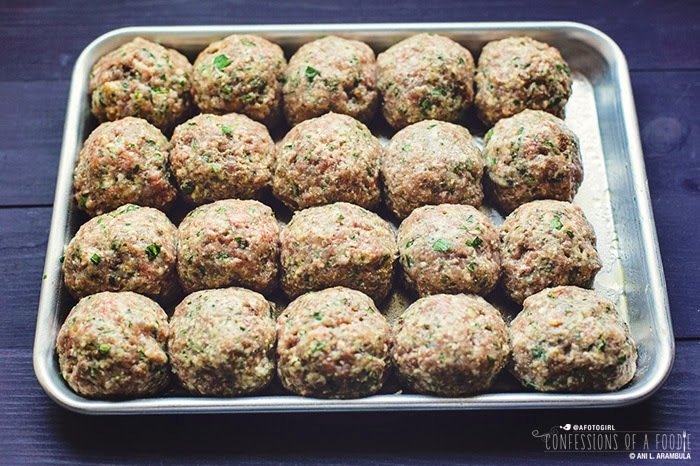 Carefully roll into a ball shape, handling the meatball as little as possible then place onto the prepared baking pan. Continue with the remainder of the meat. Bake meatballs for 20 minutes in a 400 degree oven. Meatballs are done when internal temperature registers 160 degrees on a meat thermometer. When finished cooking, remove from oven, tent with foil and allow to rest 10 minutes. 8. To make sauce: Drizzle the olive oil into a large skillet. When shimmering, add onion and celery; cook for 2 minutes, stirring occasionally. Add garlic and continue to stir and cook 1 minute more. Add crushed tomatoes, tomato sauce, tomato paste and stir well to combine. Sprinkle in the salt, pepper and chile powder; taste and adjust seasoning. Add the sprig of oregano and basil and bring sauce to a boil. Turn heat off heat and remove herb sprigs. 9. 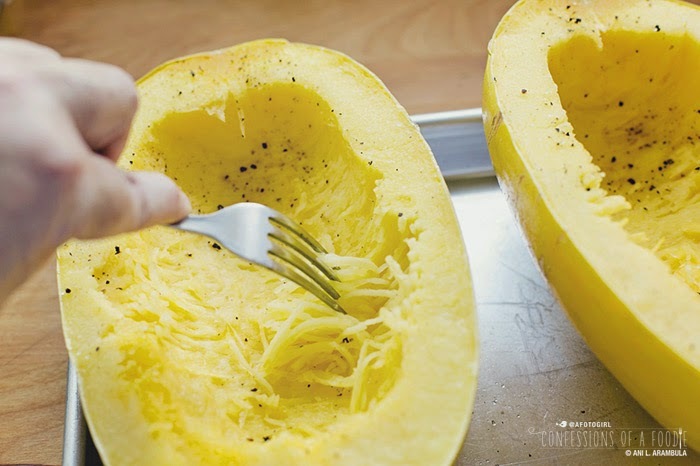 To serve: Rake the squash with a fork to create "noodles" and divide between 6 pasta bowls. Add 12 meatballs to the sauce, turn to coat, then scoop out two meatballs into each bowl. Divide the sauce between the bowls. 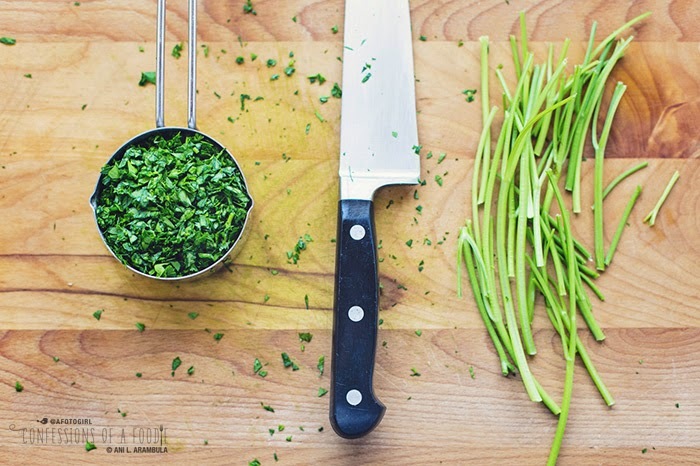 Garnish with additional parmesan cheese and fresh chopped parsley or basil. 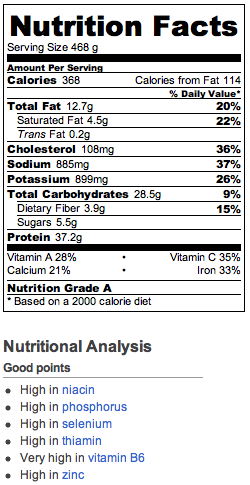 Note: I use a consumer site to analyze my recipes and approximate nutritional data. Accuracy is not guaranteed but I use it as an approximation to help me make more informed choices. I hope you find it useful. Have a wonderful week, everyone. Until next time … Buon appetito! 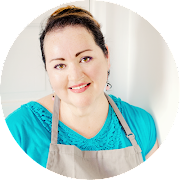 I will definitely be using your recipe as a starting point the next time I make meatballs... can't use the bread but I love the tip about the big fork! Thanks! Pinned! Hi Stephanie! :) That's great! Glad you liked the recipe. I have actually made these when I didn't have bread… I mixed some part skim ricotta with the milk because that's what I had on hand. i have never made meatballs before! these look delicious.. totally loving the recipe. definitely need to make it!